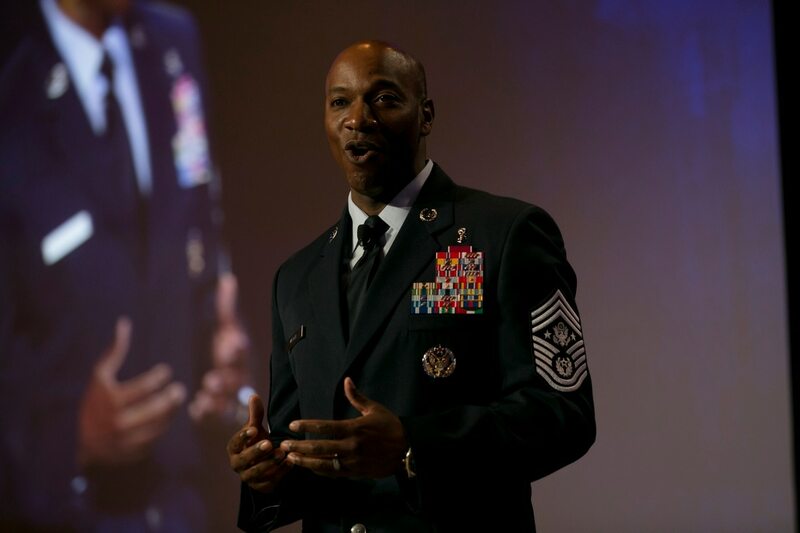 ORLANDO, Fla. — The new chief master sergeant of the Air Force, Kaleth Wright, on Thursday challenged the service's leaders to step up their game and fix the morale problems affecting the force. "We can't fix this with more time off and more picnics," Wright said in response to a question about morale at the Air Force Association's Air Warfare Symposium. "This is where we have to grind. This is where [we], as leaders, have to put to use all of the skills that we learned in our development and training and PME, where we have to motivate, encourage and inspire. We have to solve problems at the highest level. We are responsible for creating an environment where our airmen can thrive." Wright said morale levels vary throughout the enlisted force. Some commands may be having problems dealing with high operations tempos, low manning and resource shortages, while other commands may not be struggling as much. That is where leaders need to step in and figure out exactly what is dragging down morale in their units, he said. "We can get down, we can understand the challenges, we can understand the issues of those individual airmen, those individual flights or sections, and address those," Wright said. "Making the determination that morale is low: That's the easy part. The hard part is, what are you going to do about it?" In his speech to AFA — his first as the Air Force's top enlisted airman — Wright underlined his intention to build a more "resilient" force of enlisted airmen and their families, one that can better handle the heavy mission requirements the service now faces. He also said he wants to focus on improving how the Air Force trains. "You don't become a champion on the field," Wright said. "You become a champion in practice." Wright said an old boss taught him the importance of "focused, deliberate training." "You push them right to the edge of mutiny, and then you allow them to recover," Wright said. "That's the type of focused training all of our airmen need." Wright said a renewed focus on training will help with Chief of Staff Gen. Dave Goldfein's intention to revitalize the Air Force's squadrons, which tend to be about 85 to 90 percent enlisted. "The best thing that we can do, particularly as enlisted airmen, is make sure those airmen are well-trained," Wright said. Wright also suggested a renewed focus on building character could help correct some of the disciplinary problems that have led to embarrassing, high-profile firings. "We've had some issues over the years — and recently — with [airmen] not doing so well, actually having to be removed from certain positions," Wright said. "It's hard for me to think of many of these airmen who were removed for incompetence, because they didn't have the right skill set, because it wasn't the right time, they didn't have the right training. Almost all of them have been because of character. They didn't have the right character. And so we have to fix that. We owe our airmen much better than that."